Chanukah at KAJ (courtesy of author). One of the highlights of Chanukah in Washington Heights is the candlelighting at K’hal Adath Jeshurun (KAJ/”Breuer’s”) and the singing of Maoz Tzur by the KAJ choir between Mincha and Maariv. (Please click here and here to view more.) This event, aside from being inherently inspiring, undoubtedly arouses various thoughts and feelings on the part of all who attend. That there is probably no other congregation on earth whose history is so identified with Chanukah. An unswervingly devoted group of about a dozen Orthodox Jews who struggled to preserve Torah in Germany almost a century and a half ago in the face of unprecedented assimilation, hiring a dynamic, unapologetic rav and master spokesman (Rabbi Samson Raphael Hirsch) as its leader and seceding from the religiously-compromised communal structure, to emerge as the primary and leading force of Torah in Western Europe, quickly developing into a major congregation of hundreds of families with an extensive chinuch (Torah education) system, igniting a glorious renewal and rededication of Avodas Hashem (Service of God). 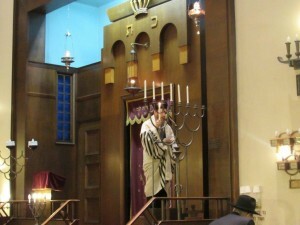 The modern-day embodiment of the Chashmonaim (Hasmoneans) and the story of Chanukah. Boundless thanks to God that this congregation was uniquely spared from the Churban (Destruction) of European Jewry. Personal inspiration. Although the Gordimer family hails from Telshe and Minsk, and my family’s minhagim are those of northeast Europe (“Lita“), one of my maternal great-grandfathers came from Germany, from a small town near Brandenburg. He, along with his parents and brothers, moved to Galicia (southeastern Poland/western Ukraine), where he married into a local family with deep Chassidic roots. Nonetheless, in the face of the Haskalah(“Enlightenment”) Movement making its way east, this “Yekkishe” (German Jewish) great-grandfather of mine remained the most religiously-committed of the clan. My great-grandfather brought his family to America in 1920, and as they did not have a menorah with them as they left Europe, my great-grandfather, insistent to light Chanukah candles, carved potato skins into makeshift candleholders and lit for the family en route. Although I never met this great-grandfather, his commitment serves as a personal inspiration. He is my family’s personal connection to the beautiful German-Jewish Chanukah observances that we are privileged to attend this and every year. May the traditions of Chanukah continue to enlighten and inspire us all and compel us to commit further to our Mesorah.